Your opportunity to enjoy an unforgettable fishing experience! Welcome to Quepos Costa Rica Fishing. 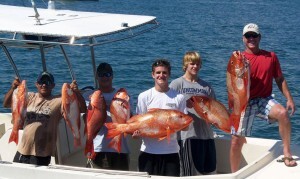 If you are in search of an exciting and unbeatable fishing experience you have come to the right place. From Snook to Red Snappers; there is a diverse array of fish for you to test yourself against whilst fishing in Quepos. If that wasn’t enough, you also have the stunning backdrop of the town itself, the exquisite white beaches and the crystal clear ocean. There is nowhere better to enjoy a fun-filled fishing vacation than in Costa Rica with us, we provide you with everything you need to make the most of your trip. From novice to experienced anglers; fishing in Quepos provides an experience that all can enjoy. We present you with the chance to catch all of the species the water in the area provides. This includes everything from Roosterfish, to Snapper, to Marlin, to Snook, to Dorado, to Wahoo, and much, much more. The day begins bright and early at 7 a.m. whereby you will board the boat and begin your excursion by hunting for sardines. You will then travel to the best spots in Quepos for all of the species mentioned. Many people come to Quepos to try their hand at catching Snook. 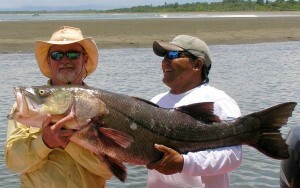 An individual fishing in the Costa Rican waters holds the world record for the biggest Snook. This comes in at a massive 53 lbs. 10 ounces. Do you think you could better this? Give it a try with us. Or, perhaps you would prefer to enjoy the thrill of catching the mighty Roosterfish? Typically you will find Roosterfish weighing between 25 to 50 lbs. yet there are those as big as 75 lbs. found in Costa Rica’s waters. No matter whether it is Roosterfish, Snook or any other species you are interested in, you will benefit from the best crew and the best boats when going on an excursion with us. From our Panga 29 FT to the large center console 32 FT; we have a great selection of boats and we know what works well when fishing in Quepos. You will struggle to find a group of people with better knowledge of the waters in the area than us. 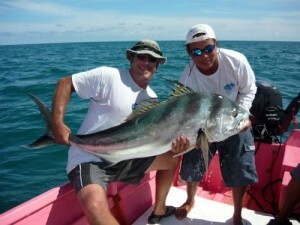 If you are looking for the best vacation possible, then look into coming to Costa Rica and make sure you go fishing!